Taste test: These are fairly ordinary potato chips, but the packaging was unusual enough to turn quite a few heads around the chip bowl. These chips come in a box (roughly the size of a box of cereal) that looks like something out of the 1940s, containing two clear bags of potato chips. The chips were kind of greasy and pretty salty but had a lot of potato flavor. 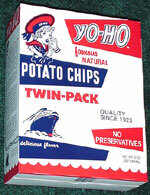 Company: Yo-Ho Food Products Co. This snack was discovered by Jeremy at Adventures, Framingham, Massachusetts.